你的位置：ww12345678 的部落格 | AX Helper > 网络文摘 > Powerful Mobile Workspaces/Apps in Dynamics 365 For Finance and Operations, for Android and iOS, Get more done on the Go! Starting with the Update 3 release of Dynamics 365 For Finance and Operations (I will refer this as D365FO from here on), Microsoft introduced the concept of “Mobile Workspaces” for D365FO. This works across all major mobile platforms, i.e. Android, iOS and Windows. The idea behind the mobile workspaces is to create and enable business process experiences for users of D365FO on mobile devices of any form factor, with purpose-built workspaces for various functions such as, Expense entry, Expense approval, timesheet entry, timesheet approval, invoices approval and more. All these workspaces are contained within one app, that you can download from Google Play Store or Apple Appstore. These are NOT individual mobile apps to address specific business process functions. One of the key advantages of these workspaces is that, these are more configurable, that power users of an organization can create , instead of requiring heavy development skills (You would need to have basic level of understanding of the technical concepts of D365FO). I explained these mobile workspaces in one of my earlier blog posts here. Today, I was able to use the preview version of ‘Expense Management Mobile Workspace” on my android phone and found it phenomenally usefully. Mobile capabilities in an ERP that is really meaningful and easy to use, FINALLY !!! Here is a summary of my experience of using these mobile workspaces/apps. One of the most important features that everyone needs in an expense reporting mobile app is the ability to easily enter expenses and easily capture receipts and upload them to the expense reports. The Mobile workspace addresses this in a very neat manner. This preview version of the app that I was able to play with, does both of these functions seamlessly in a very convenient way. Easy to use interface. Nice use of the real estate. Works lightening fast, Almost instantaneous.!!! 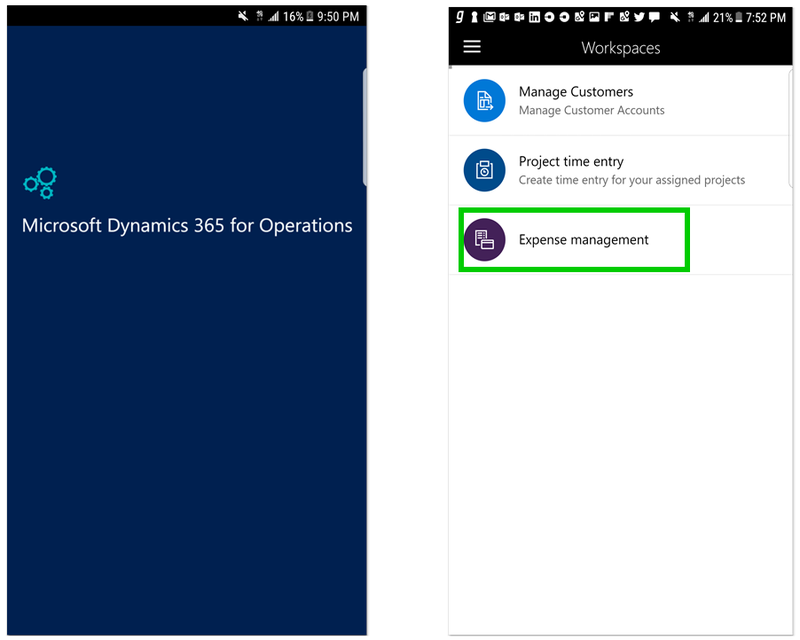 You can download the app for Dynamics 365 for Operations here. Login to the app and view all available workspaces. For example, I have a few workspaces in my environment, as seen in screenshot below. Quick Receipt Capture using Mobile App. 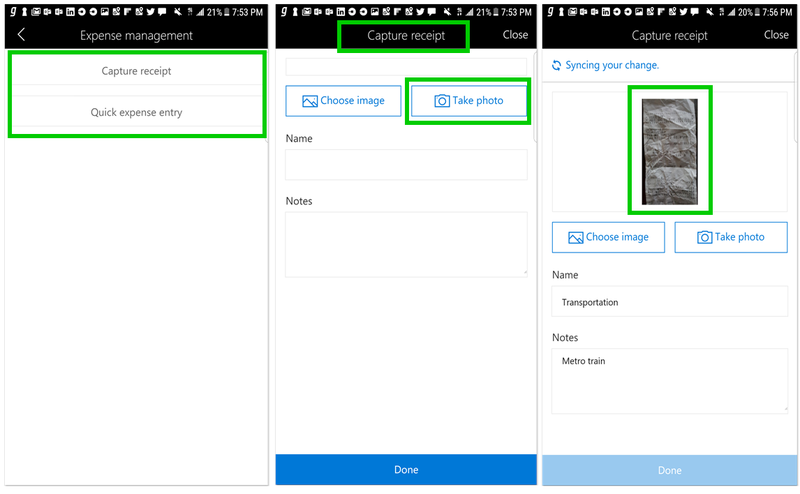 You can take a photo or import an image from gallery and see receipts immediately in self-service workspace. 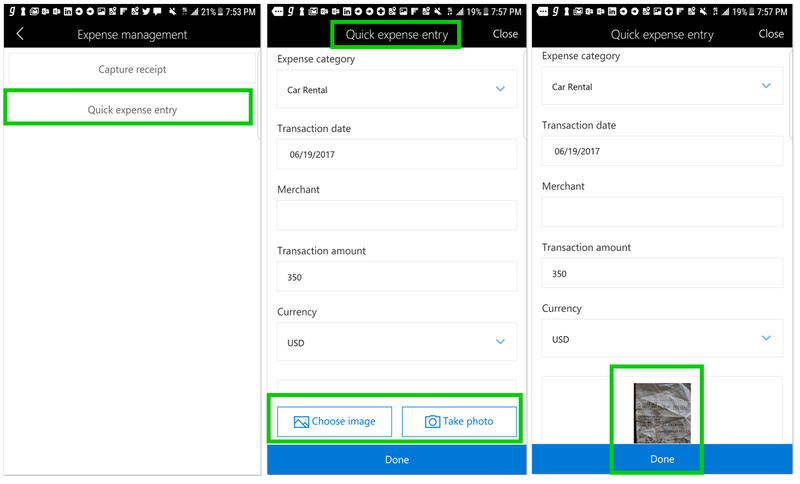 Enter Quick Expense lines using the mobile app and see the expense line instantaneously in Expense reports in self-service workspace. The Mobile workspace and app for D365FO supports Offline capabilities also. You can enter your time and expenses and upload receipts when you are not connected or even when in airplane mode. The changes will sync immediately when you come back online. I was able to test this too and it worked flawlessly!! This was just a preview version of the Expense management workspace that I tested. When the Spring release 2017 is available for download in next few days, the full-fledged app/workspace will be available, which will have a lot more capabilities such as below. Create and submit expense reports using the app for reimbursement. Create expense report details such as expense itemization, guest expense split as per policy and more. Attach credit card transactions for expense reporting. Expense policies validated in real-time within the app. Review and approve expense reports in the app. Along with this, there will be several out of the box mobile capabilities for Project Time Entry (I was able to test the preview version of this app and it worked great too), Project time approval, Invoice approvals, Sales Orders management etc. and the list is going grow soon. 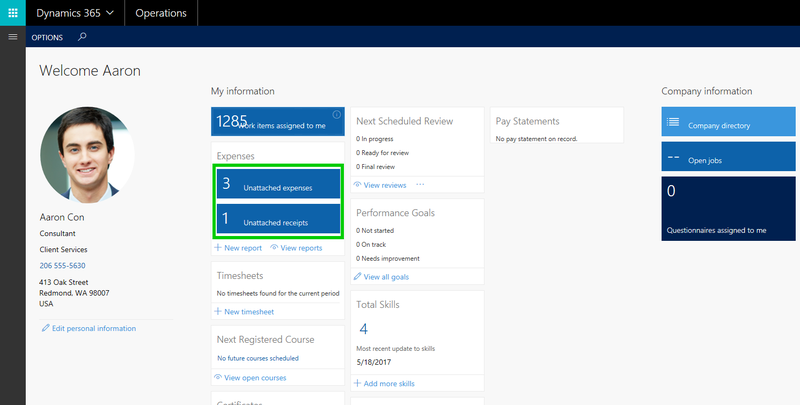 Stay tuned for the next post on my analysis of the Spring 2017 release of Dynamics 365 For Finance and Operations, which should be available for download in next few days.